Miva Merchant is a highly preferred eCommerce solution for modern businesses. Regardless of your business size, Miva brings some great features to the table you cannot ignore. Normally E-commerce systems are unable to provide best price value but with Miva, the gaps between quality and price have been cut down a great deal. Offering high user feasibility and convenience, Miva has been providing services to some of the most renowned businesses allover United States. It has been behind $100 billion sales over a period of 19 years. Online sales sites have shown great trust in this software which is why Miva was rated at the top by G2Crowd. To get started with the product free of cost, you can take an online tour to familiarize with the features and offerings in this software. Some highly customizable automation options and sales assistance ensure that you stay ahead of the eight ball. There are so many variables attached to an E-commerce website and Miva addresses to most of them. Design your platform architecture the way you like. This platform is scalable to any business size making it useful for large enterprises as well as growing businesses. The data is hosted by the providers themselves relieving you from the worries of maintenance and support to a great extent. Highly customizable and responsive, Miva interface is highly flexible and responsive. Whether you have a furniture shop or a pharmacy, the customization options are endless. Libraries and search options make it easier for your customers to get to their desired products. Presentation is the key to success for E-commerce websites. Miva has some attractive themes allowing you to display unlimited products. Show them in tabs or in a visual library. You get to make product bundles while managing all the prices. Just to make sure that your online store appears on search engines, SEO solutions and keyword based indexing from Miva come in handy so that you stay ahead of your counterparts. It focuses on making clean URLs with easy linking of pages on your website. You can maintain your customers’ accounts for quicker transactions. Integrations with top payment services will make it easier for your customers during online payment. Inventory monitoring allows you to look into availability of items. There are also prompt notifications regarding stock levels so that you never run out of stock. 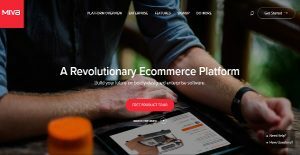 Each company has its own characteristics, and might call for a particular type of eCommerce Software solution that will be designed for their business size, type of customers and employees and even individual industry they cater to. We advise you don't count on getting an ideal services that will work for every business no matter what their background is. It may be a good idea to read a few Miva Merchant reviews first and even then you should remember what the solution is supposed to do for your company and your staff. Do you need an easy and intuitive solution with only essential functions? Will you really use the advanced tools required by experts and big enterprises? Are there any specific features that are especially useful for the industry you work in? If you ask yourself these questions it is going to be much easier to locate a solid service that will match your budget. How Much Does Miva Merchant Cost? Four pricing plans (including an enterprise pricing one) are available as per requirement. Hence, Miva can be used by businesses of any magnitude. Starter Plan is available for $79.95/mo. It is for smaller and growing stores and has the following features. Business Plan is available for $249.95/mo. For established businesses, it is just the ideal package. Professional Plan is available at $749.95/mo. It addresses to the needs of much larger stores having big inventories. The Enterprise plan is perfect for big stores that have a wide range of products on sale. It is available for $1495/mo. and offers the following features. We realize that when you make a decision to buy Sales Software it’s important not only to see how experts evaluate it in their reviews, but also to find out if the real people and companies that buy it are actually satisfied with the product. That’s why we’ve created our behavior-based Customer Satisfaction Algorithm™ that gathers customer reviews, comments and Miva Merchant reviews across a wide range of social media sites. The data is then presented in an easy to digest form showing how many people had positive and negative experience with Miva Merchant. With that information at hand you should be equipped to make an informed buying decision that you won’t regret. What are Miva Merchant pricing details? What integrations are available for Miva Merchant? Pros: Miva has helped make our site fully scalable to any device and we have seen our mobile transactions growing exponentially. It also has a very responsive team to work with. They really listen to our needs and they have a good blend of seasoned professionals and young talent to help you and your business. Cons: Google organic ranking and SEO optimization for our custom site is always a challenge. I hope this gets to be addressed. Other than that, I have no compaints about the software. Pros: Our products being perishable, we can fully customize the tool to suit our shipping needs. It has helped us to automate orders and fulfill different needs depending on the orders that are placed. Apart from that, it integrates well with tools such as Listrak which we use in our email marketing platform. Cons: The reporting feature is not functioning as it should be. When it comes to driving sales as an online business, you need information on the go. For example, you need to access data on sales, the rate of conversion, customer buying behavior and rate of bounce, all in real-time. Miva is, however, not easy to use if you want to access data now and thus hinders efficient decision making. With such drawbacks, we are sometimes forced to look elsewhere for data, which can take most of our time. If you need more information about Miva Merchant or you simply have a question let us know what you need and we’ll forward your request directly to the vendor.